Applesauce is great for making baked goods fat free. 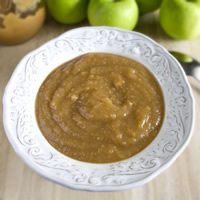 You can replace many butter and oils with applesauce, which is always useful during the holidays. Combine all ingredients in a medium pot and bring to a boil. Cover and reduce heat to medium low. Simmer for 25 to 30 minutes. Mash apple sauce with a potato masher until it’s your desired consistency. Can also be frozen and stored for up to a year.